Kyoto is the cultural hub of Japan. It offers the quintessential Japanese experience that you’ve probably seen on TV or in movies. There are real Geishas roaming the streets, tea ceremonies to attend, and temples in which you can stay overnight. Taking authentic cooking classes is a great way to immerse yourself in the culture, and there are lots of other traditions to experience too. Here are 7 cool Kyoto traditions that you may not know about. Some may surprise you. A Yuzen kimono is characterized by its bright colors and artistic designs. This is achieved by the Yuzen dyeing style which was established in the 1600s by Miyazaki Yuzen, a local artist. Since these kimonos take so much time and effort, they aren’t as available as other types of kimonos. This makes them rare and highly sought after. Kyoto residents visit this shrine on January first each year. 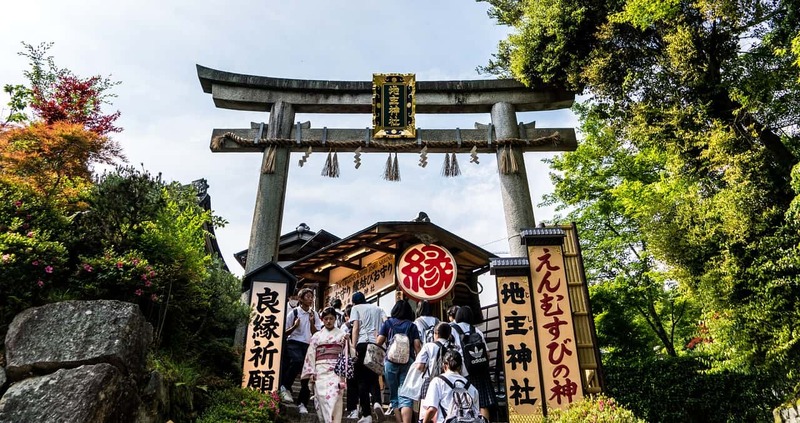 To honor the ancient gods, visitors will ring a bell once they arrive at the shrine. They do this quite naturally and onlookers may not notice if it wasn’t for the beautiful kimonos worn by the local women. Food and drink are also important to the people of Kyoto during this day. Kemari is an ancient sport that can be compared to football. It takes place each year on January fourth at the Shimogamo Shrine in Kyoto. While it appears like the participants are in competition, they are really acting out the sport based on traditional rituals and etiquette. Watching the players in their elaborate costumes is one of the best parts. Requiring a brush and ink, Shodo Calligraphy is an artistic way to represent the kanji characters. This type of calligraphy actually started in China but when it made its way to Japan, it was adopted in Kyoto first. This happened during the Heian period from 794 to 1185, and it was during this time that the unique, Japanese style of calligraphy was born. Today, this kind of writing is used for important ceremonies and writing greeting cards on New Year’s day. This festival is held on the third of February every year. People line the streets to toss beans at nearby homes and wish the families inside good health. Japanese dancing girls (Maiko) will be wearing colorful and elaborate kimonos as they join in and throw beans as well. While the festival itself is quite the sight, one of the highlights is the chance to see Maiko as they rarely make an appearance in Kyoto. While you’ve probably heard of kimonos, you may not know that they are a tradition that came from Kyoto. The city’s Nishijin district is where most of this beautiful kimono fabric comes from, as well as the obi (the sash that ties around the waist.) Since Geishas have their roots in Kyoto, and kimonos are their traditional dress, it’s easy to see why this city is the epicenter of this traditional garment. March 3rd is the Doll Festival in Japan. While this takes place in most regions, the doll altars in Kyoto are different from those in Tokyo and elsewhere. Japanese families usually set up altars filled with dolls, rice cakes, and peach blossoms. However, altars in Kyoto are made with little kitchens and hearths for cooking. You’ll only find these features on altars from Kyoto as it is their tradition. Kyoto is full of culture and traditions, which is a huge part of its charm. If you are visiting this city and want to dive into the culture, there are many more ways than one. If you would like to book a cooking class in Kyoto, please do get in touch with us today.